First, let me say that unlike a lot of the blogs I post, this is not informative, but cathartic. You’re not going to become a better gamer from reading this post. It’s not a review of something cool coming out. This is something I need to write down, and I want to see what other people have to say about it. I’m going to be real here, for a minute. Gaming as a kid was a source of fun, certainly, but also a source of great stress for me growing up. It was 1985. This was both the height of gaming’s popularity, but also the height of the various Dungeons and Dragons Controversies which centered largely around the belief that it was intrinsically involved with devil-worship. Jack Chick published “Dark Dungeons” (viewable here,) which captures what many people though at the time. Most probably didn’t give it any thought at all, but just accepted it because their neighbor or minister said it was satanic, or they saw something on 60 Minutes about it. Really, why or how that came to be perceived that way is irrelevant. The fact was, my folks seemed to believe, even if halfheartedly, that it was true. Strangely, they didn’t entirely keep me from pursuing it. They just didn’t like it. I struggled with that as a kid. Being really into something, and knowing that my parents, who I loved very much, thoroughly disapproved of it left me with a bit of a pit in my stomach sometimes. I’m almost certain they thought it was just another phase; a passing interest that would come and go just like other interests had in the past. They investigated it a little bit, and nothing obviously harmful seemed to come from it. But even into college, they discouraged me. To this day, I hesitate mentioning gaming to them, despite the 30 years that have passed since that first game. I have children of my own now. While I showed my daughter the game when she was younger, she didn’t embrace it, and I didn’t push her to. My son, however, asked about it and pursued it, and recently asked to play “my game” and so, a few weeks ago, I decided to let him give it a try. Perhaps because of my history, I’ve felt strange about children playing games… Felt strange in a way that shocked me… gnawed at me. I went to SCARAB a few years ago, and saw a group of children (ages 8-11) playing a ‘kids track’ series of games based on the Warriors by Erin Hunter. I’m not sure if it was the time of the day (the kids would have been playing for probably 4-6 hours by then) or the windowless room they played in, or just my history, but I felt bad for them. Sick almost. It felt wrong to have kids inside rolling dice and imagining adventures rather than outside and acting them out, if not living them. I recalled, however, that as a kid, I would have killed to have the chance to go to a gaming convention, and probably would have loved something that spoke to fiction that I loved and was familiar with. I went again to SCARAB earlier this year, saw a similar table with similar kids, and despite the obvious joy I saw on their faces, I felt uneasy. With that as a backdrop, I began making a character with you 5 year-old son, using pictures from the book and summaries of character roles to allow him to make his choices. We used 5th Edition D&D which is classic and streamlined enough not to overwhelm him with choices. He went with a rogue, based on a picture of strong but secretive agent of some sort in a tavern early in the book. I ran through some feats, summarizing them and he picked one I wouldn’t have, but which turned out to actually be very good. I pulled something out of my head and we started playing. I put a single ally, a priest, in his party and described them as old friends that had grown up together in their small town, and had decided to go off to check the ruins of a castle nearby, chasing rumors of gold and jewels said to have been lost beneath the old keep. We fought some goblins, which he was a little timid about, but when he saw he could gain the upper hand, attacked with gusto. He tended to enjoy the idea of being unseen more than anything else, and greedily captured as much gold as he could before a mob of goblins chased him and his friend out of the dungeon. I have a vast collection of Dwarven Forge, and so we were able to do this right. The encounters were three dimensional and all details were present, including a swiveling secret door. When we wrapped up, he begged me to continue, obviously having fun. As a young boy who grew up into a man with reservations about D&D, especially as it related to his children, I felt mixed emotions as he pressed me to continue. In many ways, when I first became a father, I hoped to create my own little gaming group and share with my children all the things I had done and still hope to do. This moment was a realization of something I had contemplated for decades. It was an indescribable feeling (I can’t put it into writing… but numerous emotions, not all positive, tugged at me). We played on. 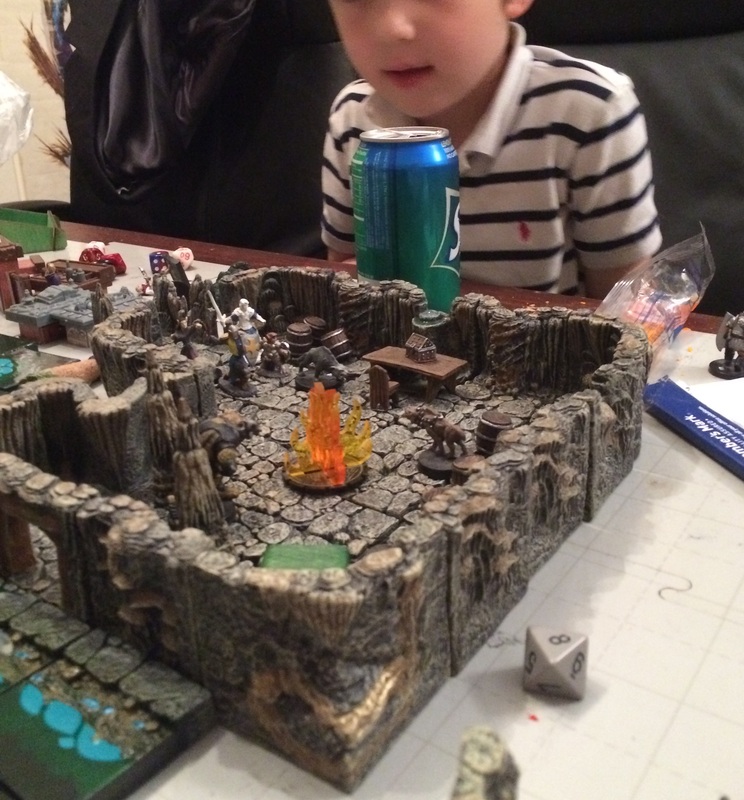 I finally crafted a final confrontation with the evil wizard commanding the goblins, adding an NPC fighter to balance out the small party my son was guiding. As the wizard stood to challenge the party and call forth zombies to march against them, my son surprised me. So… My son appears to either be a sociopath, or has the makings of a great game master some day. He has pressed to play again, and we have revisited it but sometimes it becomes more about the setting and figures than about the game itself. He remains young for the game. But I still feel that hesitation, and want to hear what other parents have felt or how they have acted in introducing their children to games. Monte Cook has kickstarted No Thank You, Evil as a starter RPG for families, and maybe something like that would be better suited (though it sounds like my boy needs a game called, “More Evil, Please” from his last game). There are a variety of second and third generation gamers that are introducing the next generation to the hobby, and various products that support that goal. Maybe I need to just get over it and let him play. In the end, I think that exposure is good, but moderation is essential. This will start as an occasional thing and we’ll see where it goes as he gets a little older. The only thing I know is that I won’t be passing on to him condemnation of his interests, whether they be this or something else that I don’t fully understand, but instead will seek understanding myself and encourage him to be who he wants to be. If you missed out on the Dark Sword Miniatures Elmore Dragon diorama, you will be kicking yourself like I am. You could have gotten a good dozen quality Dark Sword Miniatures for your pledge with the diorama of Elmore’s famous dragon painting come to life. With the unlocked add-ons, another 20 or so miniatures. When it comes out for retail sales after GenCon, I’ll be first in line. I got in at the last minute on the newest Bombshell Babes diorama, a special edition of their iconic Maelee fighting robots. Since my tastes run more towards fantasy, I passed on the diorama itself, but picked up some of the robots… because robots are cool! These have a “Robby the Robot gone amok” feel to them and I can’t wait to paint them… in a couple years after I am done with the Bones. Patrick Keith is a fantastic sculptor and the Bombshell line is a fantastic idea. I can’t wait to see what comes next from his studio. Don’t bother the kids while the GM is narrating! It’s been over a year since we started this blog, and frankly I was running out of steam. We have a new plan in which we will be updating the site on Mondays, with a different guy from our group posting every week! It’s not like the gaming world has stood still since my last post, so let me bring you up to date with Skyland Games happenings. First off, ACE was a really great time! There were tons of comic vendors, people dressed up in costumes, and bunch of people having a great time gaming! 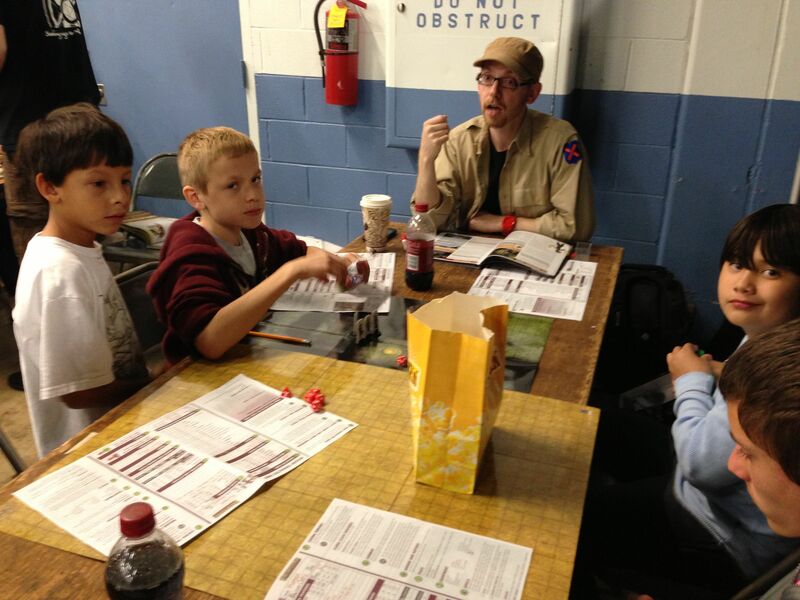 I think the best thing in the gaming corner was the 12 and under kids table, featuring the Pathfinder Beginner Box run by Venture Captain Paul Trani! The fantastic guys at The Wyvern’s Tale gave each kid a set of RPG dice just for participating! I sincerely hope we created some life-long gamers at the event. It is great to have the veteran grey-beard gamers with all the years of gaming experience and wisdom that comes with them, but in the age of pervasive video games and a million other distractions, it is increasingly important for us to recruit the next generation of gamers. According to RPG Research, things seem to be moving in the right direction. 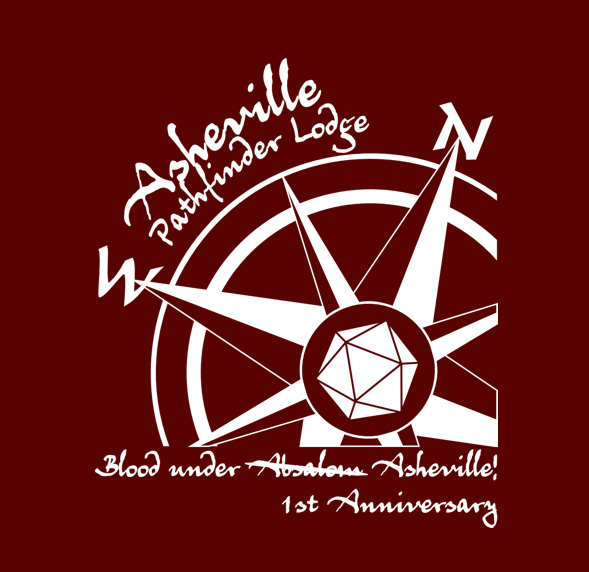 Next, the Asheville Pathfinder Lodge is flourishing! We have an awesome one year anniversary event planned. The lodge will be running several different tiers of Blood Under Absalom, a special Pathfinder Society module that can usually only be run at big cons, since it requires five simultaneous tables of players all running through the same encounters at the same time! I played through it at SCARAB last year, and it was one of the coolest RPG events I’ve ever been a part of. If you are anywhere near western North Carolina, be sure and sign up at the warhorn to reserve your seat at the table! Also, some of the guys from our group attended MACE down in Charlotte and had an excellent time playing Pathfinder Society scenarios and checking out the vendor area. More details to follow in a later post. I recently ran a DCCRPG game, in which we modified the character creation rules significantly. 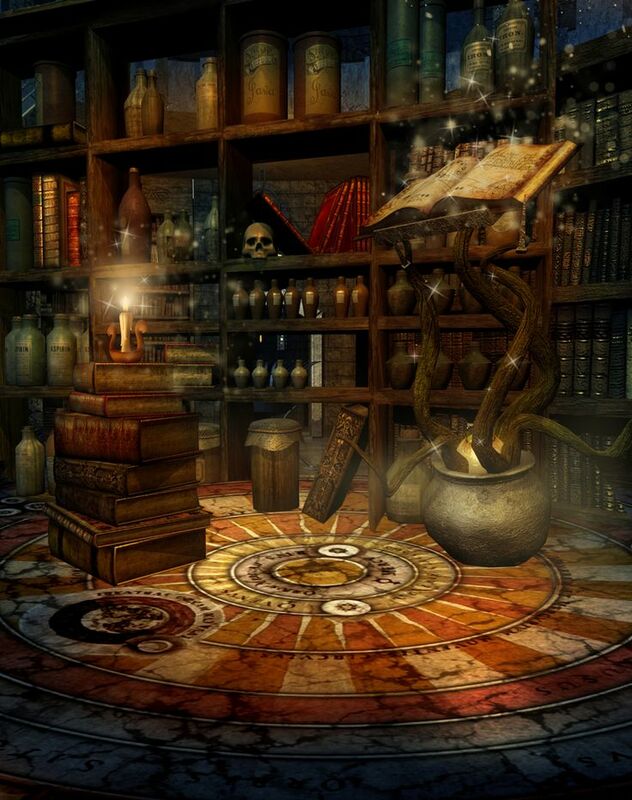 One of the chief complaints from my players about Dungeon Crawl Classics is that due to the strict character creation process (3d6 for stats in order, 1d4 hit points) the PCs in the game feel very fragile, and aren’t generally very good at any particular skill or stat. To make our heroes more, err, heroic we made the follow adjustments dubbing it the DCC Champion character creation rules: Roll 5d6 for stats, take the highest 3 numbers showing for each attribute. Choose a race/class rather than rolling. Rearrange your stats so your high rolls can be in key attributes for your race/class. Start at level 1 with maximum hit points based on the hit die for your class (4+HD). We played through about half of People of the Pit and while it was less lethal than the Rules As Written, it was still very challenging, but the PCs seemed more effective at their chosen professions. No more 12 Intelligence wizards! That being said, I’m still on the fence about whether it is better to have a PC with very average stats, that survives by wit, cunning, and that fickle mistress luck, or in the interest of heroes being heroic, its more fun to nudge the bell-curve in the players favor. I think to each there own, and as long as you have fun, everybody wins. In D&D news, the latest edition of encounters looks like they are transitioning away from 4e and allowing players to try D&Dnext as part of a public playtest. 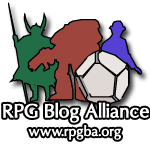 Players and DMs still need to sign up for the playtest to participate, but players who want to try it out and haven’t signed up yet can play one of the pre-gens. I met the guys that make up Skyland Games at a D&D encounters game several years ago, and the program has its merits, but just doesn’t fit my schedule right now. I am thrilled to see WotC break open the TSR vaults and reprint some old classics, but with DCCRPG being very compatible with old modules with very little conversion, I’m much more likely to run them with DCC than with 1e or DnDnext. On the magazine front, there is some sad news, as well as hope that the torch has been passed to a worthy successor. The magazine Kobold Quarterly is no more. This will allow the staff to focus on producing awesome game supplements and adventures, but it is a sad day to see the scion of the print versions of Dragon and Dungeon magazines end. As one door closes, another opens: Gygax Magazine looks to carry the banner as a print RPG magazine. Clash of Echoes has an excellent interview with Luke Gygax, one of the creators of the magazine and son of the late E. Gary Gygax. With the new magazine comes the resurrection of the TSR name, but not THAT TSR. This is a totally different TSR. It appears as though the magazine is starting under a bit of controversy as Grognardia points out, the magazine is starting without the blessing from the Gygax estate. We’ll see how it all pans out. The gameroom stayed busy with most of the Asheville Pathfinder Lodge regulars in attendance. Much thanks to Dell from SCARAB, our illustrious Venture Captain and 5-star GM. 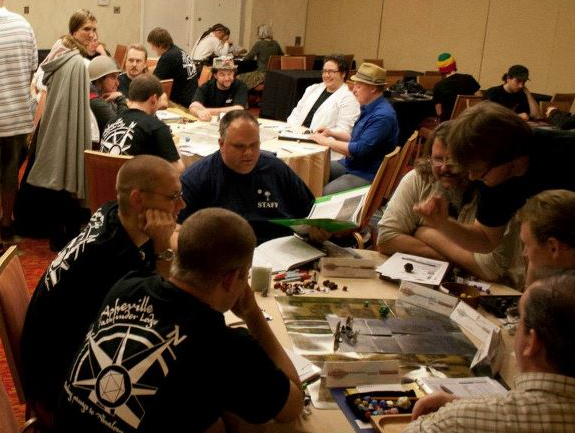 GeekOut 2012 was a blast, both in the tabletop game room and in the exhibition hall. I wish I would have had time to catch a panel, but I was too busy perfecting my goblin voice for Paizo’s We Be Goblins! There were a ton of artists there (many from the very geek-chic Asheville gallery Za-POW), some toy vendors and lots of people in costume. It certainly wasn’t a huge convention, but it was a great start. Not to mention it was completely free! There are a ton of pictures from the event on MultiverseAVL’s facebook page. It was certainly a great day of gaming, and we saw a lot of new faces around the Pathfinder tables. After speaking with a few friends who also attended, the one thing that was missing from GeekOut that used to be at fanaticon was a strong showing from comic book shops. There were a few comics to be had, but at fanaticon there was booth after booth and box after box. I’m not as big into comics as I used to be, but that drew a lot of people in, and also brought a lot of costumed cosplayers out. There were plenty of people in costume at GeekOut, but not as many comics. All and all it’s a minor complaint in what otherwise was a very fun event! In other Skyland Games news, we’ve set sail for the archipelago known as the Shackles! Last night we kicked off our second attempt at a pirates campaign, and if last night was any indication, this is going to be a very memorable run. Last night, our characters were press-ganged in to joining the crew of the Wormwood. Our party is made up of a huge Mwangi Barbarian (Mighty Hoku), a Human Cleric of Besmara (Vernon Blueskye), an Elven Ranger (Falconer, with a parrot as his “falcon,” Yandro Bowfisher), a Varisian/Taldan Rogue (Pirate archetype, you gotta have one in a pirate campaign, right? Tiberius the Brown), and a Druid of the Sea (Jhang Kel-Ket, constrictor animal companion). After working a few days on the ship and sneaking around trying to find some allies and some information, there seems to be two groups on the ship making alliances. Methinks a mutiny is afoot! The captain and his officers are cruel bastards, and I have a feeling if the party rose up against them, we wouldn’t be alone. So far it’s a really cool story, and we aren’t even through the first module yet. In fact, we only made it through 5 days, of what is supposed to be a 45 day journey! That is, if we can prevent mighty Hoku from eating all the ship’s stores before then. If you like Pathfinder and you haven’t tried an adventure path before, I highly recommend it. The amount of detail and effort that went in to Skull and Shackles is pretty amazing. Our intrepid GM, Michael Jones, has already prepared two binders full of stuff, and that was before we even got together for the first session! On our weeks when we aren’t sailing the seas, we’ll likely be continuing our exploration of the awesomeness that is Dungeon Crawl Classics RPG. Included with my Gold-Foil Special Edition of the Core Rules was a bonus adventure 66.5 Doom of the Savage Kings. It is crazy awesome and makes me want to buy all of the other modules they have slated to come out this year. Well played Goodman Games, well played.